Satisfied, the frog puts the scorpion on his back and starts the journey across the river. 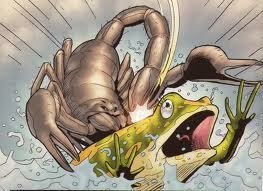 When they are halfway across, the scorpion plunges his stinger into the frog. As paralysis sets in and the frog begins to sink, knowing both will now drown, the frog asks “why?”. “Because” says the scorpion, “it is my nature”. Since the elections in November of 2011, the parable has played out. The board majority are frogs; the minority are scorpions. The board frogs keep agreeing to carry the scorpions across the river. The board scorpions keep accepting the ride, only to eventually produce their sting. The most recent example of this living parable is the replacement of majority member Nate Easley, who is leaving the board before his term is up. The board president has the legal right to essentially appoint a replacement. Instead the majority hastily developed a transparent system with an open application process and public interviews, after which the entire board votes for their preferred choices. The candidates with the most votes were placed on a short list for further discussion with the hope of a unanimous board agreement. Sounds reasonable enough. “Climb onto our backs and we’ll work together on this” say the frogs. “Okay, we will” say the participating scorpions. And then? After the board votes on applicants, the resulting short list has no Latinos. An advocacy group complains. And thus part way through this process, scorpions Kaplan and Jimenez plunge their stingers: they join the campaign against the lack of Latino candidates, despite their direct and willing participation in the very process which resulted in no Latino candidates. You read that correctly: neither Kaplan nor Jimenez voted for a single Latino candidate to advance to the short list, and then both signed a letter to protest the lack of Latino candidates on the short list. Halfway there. Sting. This is the pattern. Facing a DPS bond in a difficult fiscal climate, the board frogs publicly advocate for the measure and ask their colleagues to join them; a board scorpion leads an effort to block the bond. Sting. The board frogs finalize a consent decree for ELL students; three scorpions derail the process with a last-minute letter to the Judge. Sting. The board frogs develop a community process for the inclusion of a charter school into a northwest neighborhood; a board scorpion – after first praising the plan – eventually pens a vicious op-ed in which she argues that policy, citizen recommendations, equity, collaboration and compromise “do not matter to the majority.” Sting. Will anyone make it across the river? In truth, the scorpion behavior here is not new. The most public of previous incidents was probably board scorpions Jimenez and Kaplan voting in favor of pension refinancing, then shortly thereafter coming out in venomous opposition to it. Sting. Perhaps the most consistent board scorpion is representative Merida, whose initial act as a publicly elected official was to plunge her stinger deep into her friend and supporter. Sting. But what is new about this board since the election in the Fall or 2011 is the frogs. The ascendancy of Seawell to the presidency, as well as the election of new members Rowe and Haynes, was generally seen as a shift towards consensus and camaraderie after the prior board’s series of acrimonious 4-3 votes. This new board bloc prefers advocating for policies that attract as wide a base of support (and as few direct enemies) as possible, even if this entails watering those policies down to make them more palatable. My point here is not to say that the behavior of the scorpion is more or less correct than that of the frog. Far from it – behaviors in the natural world are immune to judgement, and frogs are not morally superior to scorpions (or vice versa). In the political realm, both behaviors are perfectly viable strategies: vicious dissent is often part of the process, as is elevating consensus over impact. But in politics, these strategies are deployed in service to some greater political end. And that greater end is what is entirely absent here. It’s pretty hard to argue that the scorpions have had any success by subverting the board majority, but at the same time the frog attempts at collaboration have resulted in even more acrimony and less effective policy then previously. The few shabby accomplishments of the DPS board over the last 15 months have been drowned in the drama. And in truth, these respective strategies of consensus and sting seem less and less a means to any board member trying to accomplish a specific policy agenda or adhere to a set of firmly held core beliefs. One would normally change the behavior in pursuit of the goal. But more and more, it seems that there is no overriding goal, and acts are simply an inherited habit and pattern. Frog must offer ride. Scorpion must sting frog. So how many more times before the board composition changes again will the frogs offer their undefended flesh while trying to advance a program, and the scorpions embrace the offer with a sting? I would wager quite a few. Denver has gone full circle, from a board praised as one of the nation’s best to one paralyzed by a repeated and almost ritual experience which neither group seems to have the ability or inclination to break. And honestly, after watching the pattern play over and over again, there is less and less point in blaming either side for their behavior. Why is this DPS board as dysfunctional as it is? Why indeed. It is their nature. This entry was posted in District Performance, Engagement and tagged DPS (Denver Public Schools). Bookmark the permalink. And who continues to be the ultimate victim of their political b.s.? As always, theitwheftyr true client, the student.